Many of my family members and relatives are talented crafts people. Here are some my posts about them. Today’s art work is not by me, although I have indirectly contributed to it. It is needlework made by my dad. He has always liked building things, but in the last few years he has got into needlework too. So when he is not busy with woodwork or picking mushrooms and berries at his cottage in Lapland (a few hours north of the Arctic Circle), he creates textile art. Some of them are Finnish woolen rugs that come as a kit, like the one he created for me, and others are entirely his own designs. This needlework piece was inspired by an art exhibition he saw, by a Finnish author and artist Rosa Liksom. I gave him some yarns from my stash for it, whatever colours happened to be available at the time (my dad is a very strong believer in creating things from materials that you have to hand, rather than going out and buying everything new). Many of the yarns were dyed by me – the reds and pinks for example, were from my madder and brazilwood experiments. I really love this piece of work. It’s a classic composition of course, but the colouring and the technique he has chosen make it unique. The palette you get from natural dyes work very well with the subject matter, as they have a particular soft warmth to them. They really glow in this work. 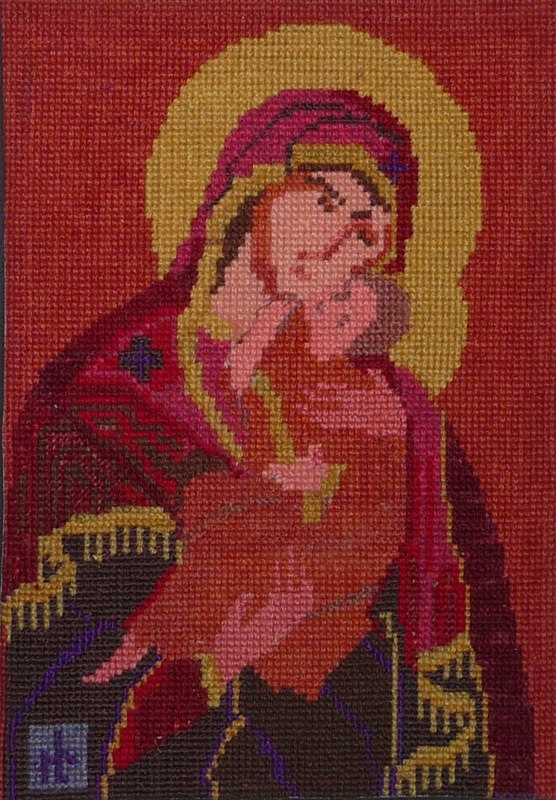 And the technique he has chosen – using cross stitch with woollen yarn, in a relatively limited range of colour tones – doesn’t allow very fine detail, but I think it is a strength in this work. It has allowed him to create a simple and strong colour block effect, removing any distracting details and making the composition stand out stronger. A real piece of inspiration! Categories: My crafty family | Tags: naturally dyed yarns, needlework | Permalink. This week I’m having an excellent time for knitting. The Chelsea Flower Show is on at the moment, and as I love plants and gardens at least as much as I love knitting, I’m watching all of the BBC coverage on the show – that’s at least an hour and half a day! 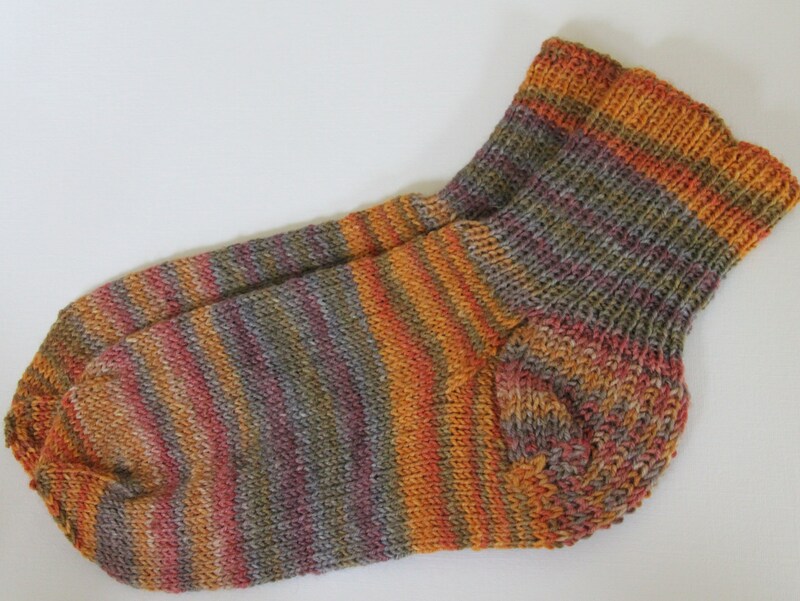 My socks from the Trekking yarn are now finished and I am very pleased with them. The first pair of socks I’ve knitted for years and I still (roughly) remember the pattern I was taught at school. I love the colours so I will definitely enjoy wearing these ones. This, of course, means that I am allowed to start a new knitting project… I feel like knitting a scarf next, using some yarn I already have in my stash. That’s because I’m not allowed to spend any more on yarns (or fabrics) for a bit, which is another new self imposed rule – who knows, maybe I’m learning to become a rational knitter! Categories: Knitting, Socks | Tags: knitting, socks, Trekking yarn | Permalink. My father came from Finland to visit me this weekend. He brought me my grandmother’s carders as I had mentioned I’d like to have a pair. My grandmother, a farmer’s daughter, was born in 1900, when Finland was still a Grand Duchy of Russia (Finland became independent in 1917). When she married my grandfather, they settled in the town of Mikkeli, in the Savo area, Eastern Finland. My grandmother did not work outside the home, but as a mother of seven she nevertheless had plenty of work to do at home. The house had a big garden, so she grow vegetables, kept some chickens and even a few sheep. My father says that when he was a little boy, he often watched his mother carding the homegrown wool and then spinning it, before knitting it into socks and mittens. One of my aunts still has the spinning wheel – I’d love to have a go one day. Although my father never spun wool himself, he says he’s watched it being done so often that he probably could figure out how to use the wheel. Apparently spinning produced a really soothing noise, so it created a lovely homely atmosphere. I have never carded wool, but I have a rough idea of how it is done. There are a several farmers who keep sheep a few minutes from my house, so I am hoping I’ll be able to get hold of some wool to practise with. I’m looking forward to being able to get my grandmother’s carders back into use again! Categories: My crafty family | Permalink. I come from a very crafty family. Maybe it is because my grandfather on my father’s side was a shoe maker and his wife, my grandmother, was a farmer’s daughter so making things was a natural part of her life too. My dad says he remembers when he was little they kept a sheep in the garden and my grandmother would spin “home grown” wool (I’d love to have a sheep in my garden… as long as she didn’t eat my plants). Most of my many aunts as well as my father inherited a talent for making things. 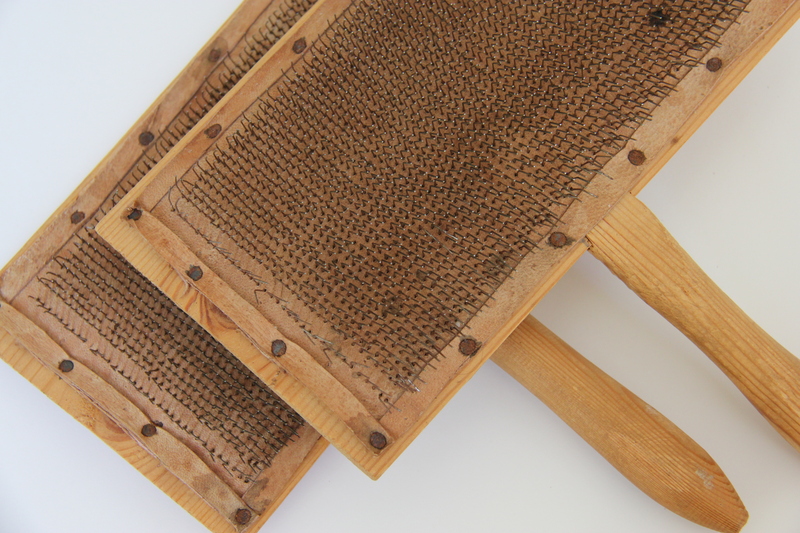 One aunt restores antique furniture as well as knits and does embroidery. 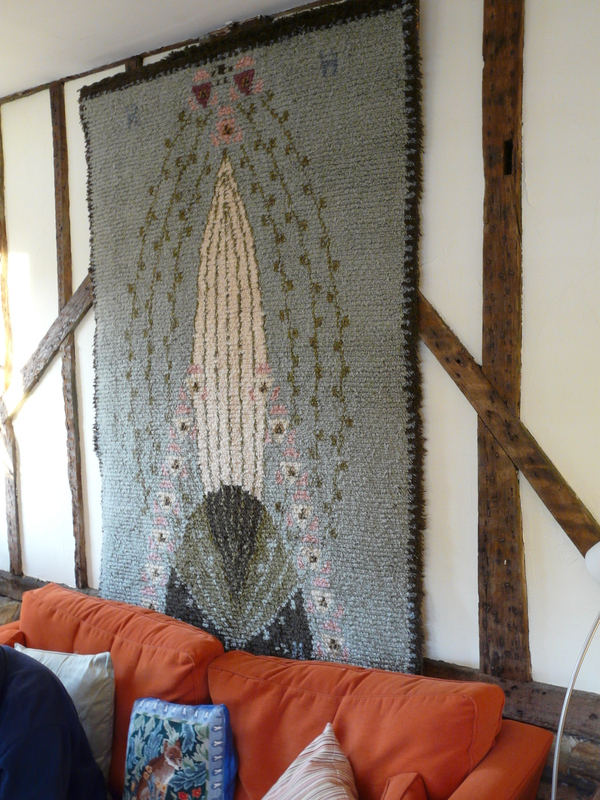 One of my cousins is a weaver and owns a craft shop, another is really into patchwork. My father has always liked wood working and building things (when he retired he built himself a cottage in Lapland). But in recent years he has suddenly really got into embroidery and other textile work (I think that is my influence as he was particularly inspired by one of my cross stitch projects). This Christmas I was really lucky to receive this beautiful wall hanging, hand stiched by my dad (it came as a kit, and took him 300 hours to complete). The design is by Eliel Saarinen (a famous Finnish architect) from the early 1900’s. The William Morris cushion you can see on the sofa has also been made by my dad.